I've been working on a way of getting better integration of my photos with the blog. Following the way Mark has been doing it, I think the Flickr solution is a reaonsable one. Unlimited upload and direct linking with the photo manager. Pretty sweet. 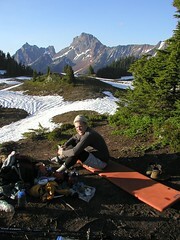 Here Tom Gaffney is waking up after a cool evening on top of Yellow Aster Butte in the Washington Cascade. Ah, the joys of the bivvy. O' the end of the semester! Tis' time for cheer! The potential dark future for anthropology?